OPEN every day from 10am. Last entry 4pm. If you are unsure of weather always check our Facebook page because that is where we will post if we have to close. When it comes to corn mazes, bigger is better. 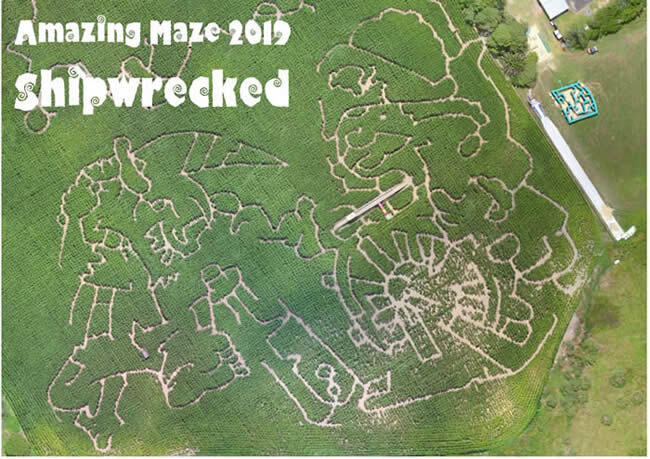 We're the home of the largest corn maze in New Zealand. 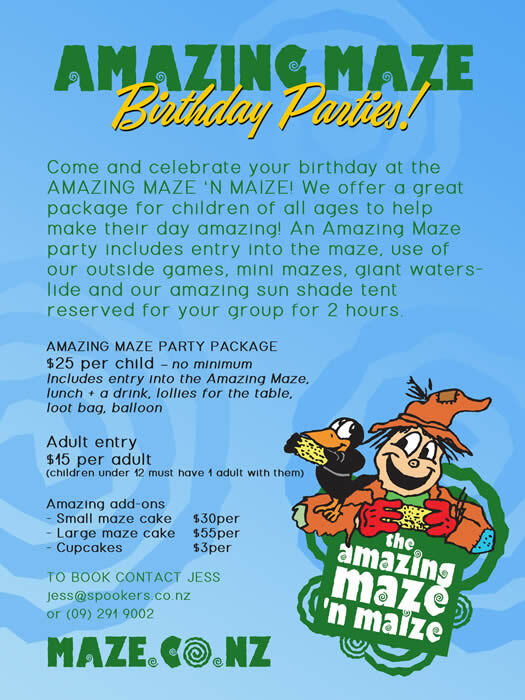 When you're lost at the Amazing Maze, you're not just wandering around aimlessly around as we have lots of activities to help you through the maze. Complete the quiz to help you navigate your way through the maze, or just get lost and have fun. Gift Vouchers See here to buy. Lots of picnic tables & shady trees. PLEASE NOTE: Tickets are bought at the Spookers main building. There are some horror and gory props on display. Please leave very young children or sensitive children in the car if you prefer. We are always happy to come out to your car to explain things if necessary. Teachers... check our our Teaching Units for levels 1-4. The Amazing Day Maze features a viewing bridge, ‘kernels of knowledge’ trivia within the maize maze and associated quizzes - great fun for family and team competitions! In our picnic area the emphasis is on good old fashioned fun - with walking boards, stilts, hoola hoops, giant drafts and others. We have lifeguards in the maze and other ways to assist you if you get really lost! CornEvil is our Haunted Horror corn maze attraction, and is strictly R.16. See more photos of past mazes in our Gallery! Site contents copyright The Amazing Maze 'n Maize unless noted otherwise. All rights reserved.